Good evening, everybody! I had a special request for a hat recently. My friend Sheetal had trouble with her hats because she needed them to cover her ears, but then the hat was always covering her eyes. She also requested a smaller flower for the side. 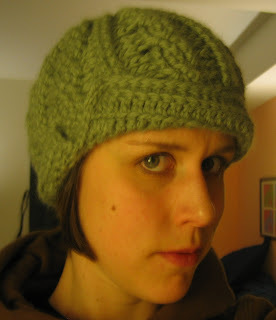 I came across this amazing hat pattern online, and I emailed it to myself with the subject: amazing cable hat. I did not think it was possible to do this pattern with crochet! I love braided cable, but I was convinced it was a knit-only. I finished with hdc in blo. In order to keep the hat covering the ears but not the eyes (without making ear-flaps), I split the end of the hat and sewed the flaps up. To be honest, I am not really sure how I handled the split. Maybe I added stitches? All I know is that this awesome hat covers the ears but not the eyes! Mission accomplished. I decided not to add the flower because I thought the hat had a lot of detail. I am still waiting to hear back from my friend, but believe this: you will hear about it if I do. Suggested blog nob reading: NermalMia. Hilarious. Amazing hat! And I love the BIG EYE. 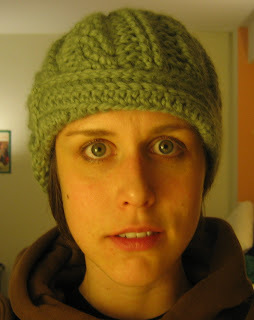 I'm crafting a lot of cabled hats and I'd love to add that one to my collection. I can send you a pattern in return too if you want. Hi, I like your hat too! It is really cute on you! What kind of yarn is it? And what size hook? 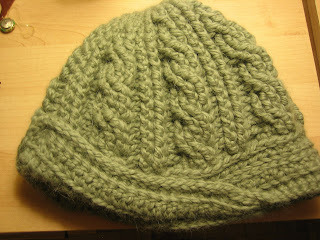 Did you make it as the pattern says and add a row of hdc? Any tips would be great. I got a bunch of yarn yesterday and am working on a bucket hat for me and an owl hat for my 9 yo daughter. I got a wool blend to try this hat, should be good I think!